For non-structural OSB, weight is the first consideration. T-STRAND Non-Residential OSB is lightweight, workable, and versatile. Mill-certified and manufactured for consistency, our non-residential OSB offers builders uniform panels ideal for non-structural and specialty applications. Quality materials: Our non-residential OSB is a mill certified panel produced with the same high-quality aspen wood fibres, wax, and resin used in our structurally certified APA panels. Lightweight formation: To achieve the desired lightweight of a non-structural panel, we have reduced the unnecessary strength and stiffness properties to a level appropriate for non-structural panels. This lightweight construction is preferred for industrial use over structural panels that are heavier and engineered for extreme loads. Accuracy: Each T-STRAND OSB product is manufactured from a precise recipe resulting in consistent boards that perform as designed. To produce our Non-Residential panel, we use the same thickness tolerance and squareness as our APA rated PRS panels. Exempt from ISPM-15 Requirements: T-STRAND OSB products are manufactured with glue, heat, and pressure, which make them exempt from the requirements in ISPM-15 and an excellent material for packaging international shipments. Indoor air quality: Tolko T-STRAND Non-Residential OSB is engineered with the same resin used to manufacture our PS 2 certified OSB. We guarantee no added urea-formaldehyde, a common and hazardous indoor air pollutant. Meeting Formaldehyde Emission Levels: T-STRAND OSB products meet HUD regulations and are exempt from CARB ATCM for Formaldehyde from Composite Wood Products and EPA’s TSCA Title VI Standard for Formaldehyde from Composite Wood. 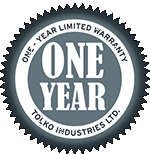 1-year limited warranty against delamination. View warranty for full details. Call our OSB sales team to ask about non residential panels.